This product has been discontinued. Please contact Pressure Engineering at 1-800-826-6342 for alternative models. The DPL53 is a high performance, high accuracy, single-channel transducer-conditioning device with a microprocessor-controlled 5-digit scalable display. Five front panel pushbuttons allow for simple calibration. All calibration values are stored in non-volatile memory to minimize set-up procedures after a power failure. 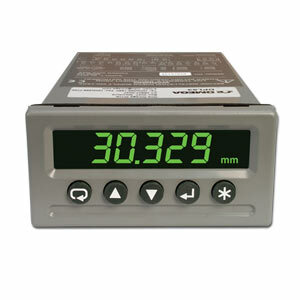 The meter has two alarm relays, which can be used for control, voltage and current analog output for signal retransmission and RS232 serial output for use with a computer or printer. The 14.7 mm (0.58") high digits make the DPL53 very easy to read. For industrial users, the system provides for diverse applications such as automatic processing, testing, etc, which requires a direct readout down to 1/10,000 mm or inch. 注: The DPL53 is compatible with Omega LD200, LD300 and LD310 AC LVDT's as well as model GP911 analog gaging probes.